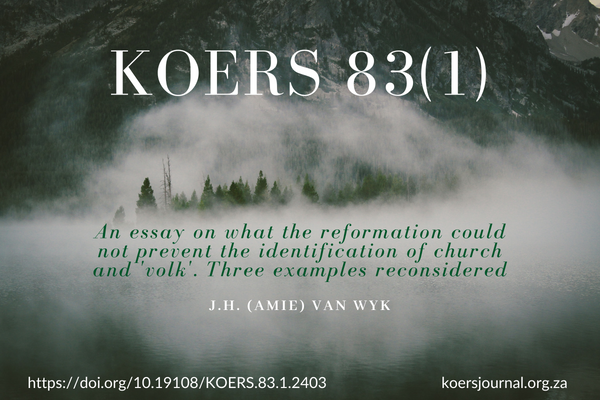 In this year of REFO 500 the author investigates the question why the Reformation with its ‘theology of sola Scriptura and solus Christus’ could not prevent the successive identification of church and ‘volk’ in history and why it could not prevent the fatal consequences this identification had for the gospel message of reconciliation, the exemplary existence of the church of Christ and the coming of the kingdom of God. Three examples serve as proof for this statement: the attitude of the Anglican Church in England during the second Anglo-Boer War (now called the South African War)(1899-1902); the Lutheran Church in Germany during the Second World War (1939-1945) and the Reformed Churches in South Africa during the years of apartheid (1948-1994). All three examples reveal an untenable identification of church and ‘volk’, although in varying degrees. How could that happen?